Written by Guest Contributor Mike James. The eighth edition of the Star Wars saga, The Last Jedi, is set to be released in December. 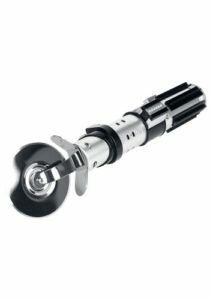 So if you’ve got a Star Wars fan with a birthday coming up, why not treat them to a themed gift to ramp up the excitement even more? Here are ten super-geeky gifts to give to the Star Wars fan in your life. Who hasn’t dreamed of snoozing inside rotting corpse of a biped snow horse? This is the unfortunate fate that befalls everyone’s favourite moisture-farmer-turned-Jedi in The Empire Strikes Back. 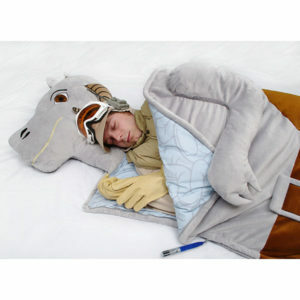 If you know a Star Wars fan who would love to recreate the experience, you can treat them to a Tauntaun sleeping bag. The attention to detail is superb; check out the lightsaber zip pull and printed entrails on the inside. Let’s just hope that haven’t been as meticulous in their work on the smell. 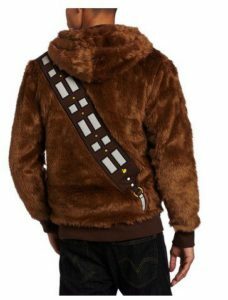 A plush Wookie hoodie seems like the ideal winter jacket. Chewbacca manages to stay pretty warm without the need for clothing, even on the ice planet of Hoth. It does seem doubtful, however, that the product is made using genuine Wookie fur. How often do you get to shield yourself from the rain and make passers-by mistake you for the Dark Lord of the Sith? 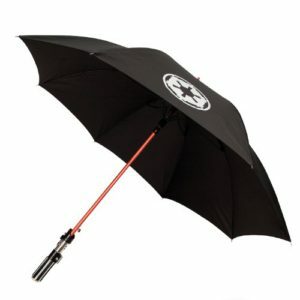 Now is your chance with the Darth Vader lightsaber umbrella. You probably remember Captain Phasma. This suave silver Stormtrooper was one of the major talking points in the trailer, but only received about two minutes of screen time in The Force Awakens. Still, the whole visual appearance is pretty striking and she will probably make further appearances. Any Star Wars super fan would love a Hot Toy model. If you’ve never heard of Hot Toys they are collectible figures that take realism to another level. 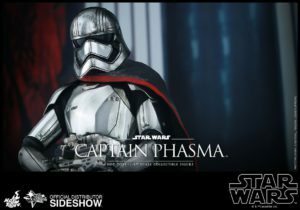 There are a variety of Star Wars options available, but Phasma has to be one of the most impressive. This pizza cutter is in the shape of Darth Vader’s lightsaber. And while you won’t be slicing your pizza with a concentrated beam of red light, the cutter does have integrated sound effects – so you can almost imagine it. Just make sure you remove the pizza from the oven in time, otherwise it might come out a little on the Dark Side. 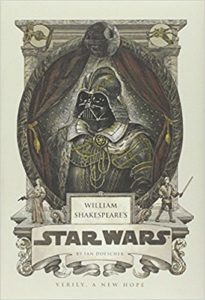 Now you can enjoy the story of Star Wars in the vernacular of Shakespeare. Sadly, these were not written by The Bard himself although at least this means that he wasn’t responsible for the creation of Jar-Jar Binks. Add a dash of Star Wars to your chow mein by using these impressive light-up chopsticks. 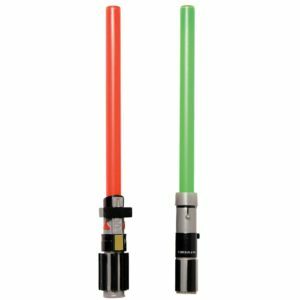 There are plenty of different options for you to choose from including Darth Vader’s sabre or Kylo Ren’s broadsword-style weapon. But maybe the best option is the glowing purple of Mace Windu’s lightsaber. How many times have you been at the luggage carousel at the airport and almost walked away with someone else’s possessions? Let’s face it – most suitcases look the same. That’s not a problem you’ll ever have again with this polycarbonate Kylo Ren model. 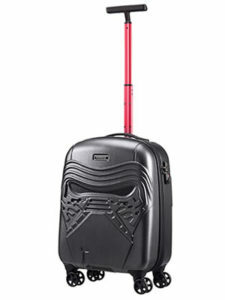 There’s definitely something quite intimidating about the face of Kylo Ren staring at you from the front of a suitcase. You imagine it’s more than enough to scare away potential thieves. 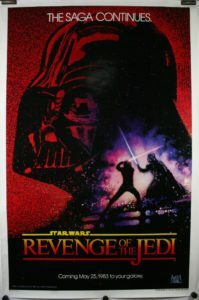 You might already know that the original name for the third instalment in the Star Wars saga was Revenge of the Jedi. The name was dropped in favour of Return of the Jedi because it was felt that the word ‘revenge’ was not something that should be associated with the Jedi. However, this title changed was decided after several thousand promotional posters had been printed. Today, these original posters are real collector’s items. You’ve got to be pretty serious if you’re going to buy one though – genuine posters usually go for thousands of pounds. If you’re not looking to splash that kind of cash, there are plenty of cheaper options to keep any Star Wars fan happy. 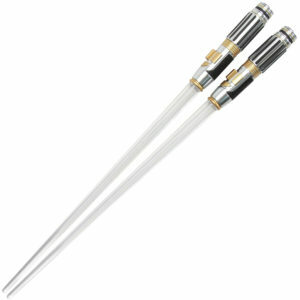 These lightsaber pens are a great choice. Mike James is an independent writer based in Brighton, UK, who specialises in nerdy stuff for work and geeky stuff for fun. When he’s not writing about cyber security or tech innovations, he loves Star Wars, Hot Toys and considers himself an avid Naughty Dog gamer. Con Prep is a new series of blog pieces providing tips, suggestions and other ideas as to help you prepare for convention season. This piece was written by Guest Contributor Cassie Tolhurst. Convention season is coming, and along with it, people dressed as Daenerys, Arya, and Sansa. You’ll see other characters too—some from galaxies far, far away or from universes yet unknown to the common person. Others descend from on high, ascend from down low, or step out of cities somehow twistedly familiar. You, as the duly appointed representative of planet Earth, recognize them all and herald their arrival at comic conventions every fall. Regardless of where the characters usually dwell, their on-screen or in-book depictions claim an ability you don’t: immunity to the need for connectivity. Fortunately, the eleven tech tips listed here can grant you that power. Some you already know from attending gaming or comic book conventions in the past. Others will provide practical inspiration for the upcoming convention season. 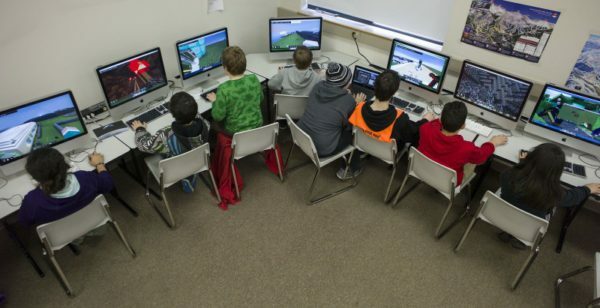 I can’t count how many times in my life I’ve heard video gamers referred to as “lazy.” And I guess I get it–I’ve skipped class to play video games. I’ve found myself staring at a screen instead of taking care of responsibilities. It’s natural to be lazy when something is entertaining you. But that’s the point: anything that entertains you can be a distraction. I reject the notion that all or even most gamers are couch potatoes that don’t get enough sun or can’t socially function. I reject the notion that gamers are less than athletes, artists, or whatever else one might do with their spare time. And I reject the notion that gamers can’t be athletes, artists, etc., as if one hobby has complete say over their total identity. 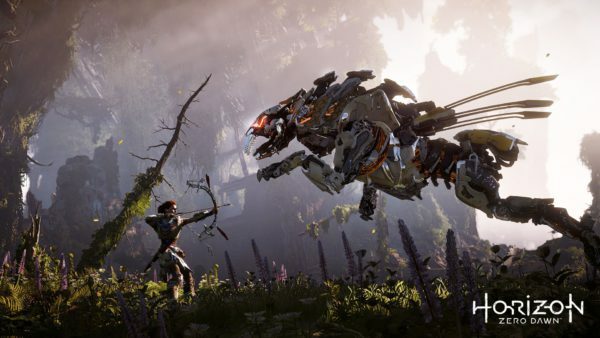 Editor’s note: With the announcement of Horizon: Zero Dawn’s DLC at the recent E3 conference last week, we’re hopeful that Aloy will continue to overthrow gender norms in Horizon Zero Dawn: The Frozen Wilds. In this post, we are excited to feature Theresa Tyree’s examination of the strong female character in the original revolutionary release. Graffiti as Art: Where Do We Draw the Line? Since antiquity, humans have needed someone else in the world to know, “I’m here. I was here. I existed.” Creation is an intrinsic part of what it means to be human, and graffiti is a tradition derived from an ancient need to express, share knowledge, warn, defend and simply mark one’s presence. 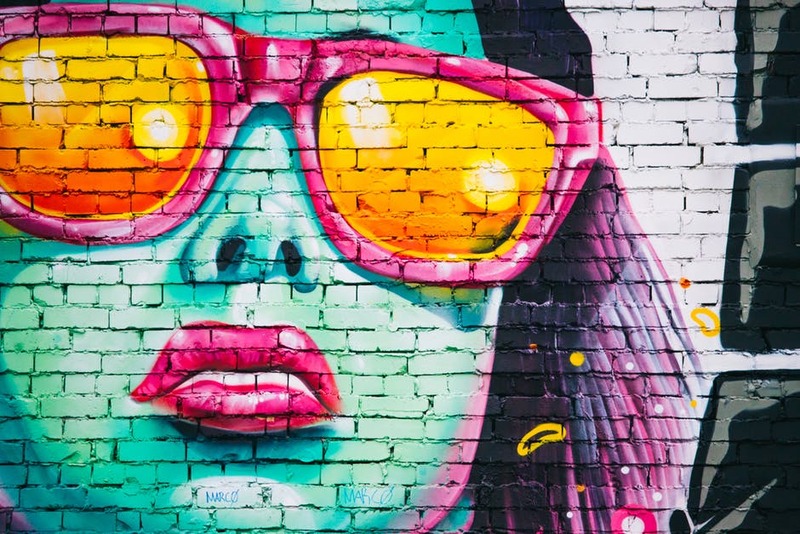 Art has historically been used as a voice for activists, but where do we draw the line when it comes to defining graffiti’s function as an art form, versus the cases in which it can only be viewed as a crime? 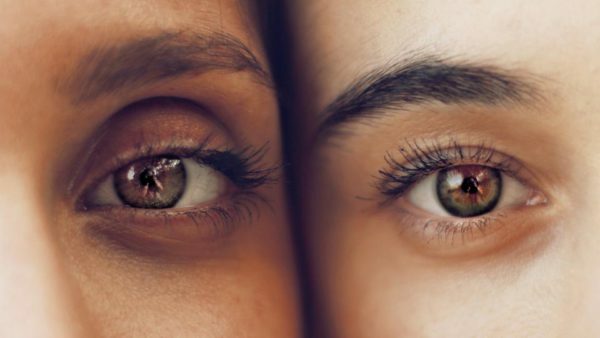 Editor’s note: Although this essay discusses specifically being an ally against structural racism in the United States, the concepts apply to many forms of allyship. The author has requested to remain anonymous. Hi. I am white and I am an ally. I am not a perfect ally—let’s go ahead and get that out of the way. I’m not even sure I could say I am a “good” ally. I would like to be, and I strive to be the best I can. But this isn’t an essay about me. I wrote this essay because I want to encourage other allies to act where they have an opportunity and responsibility to act. This is an essay about one way in which passionate allies—even those who are shy and reclusive—can be effective. Join us this Saturday, June 3rd at Barnes & Noble South Center for a free Wonder Woman Day Celebration with costumes, fun activities, and a panel discussion, “Wonder Woman IRL”. You can RSVP online, right now! A percentage of your purchases in-store on Saturday (or online June 3rd to 8th) will be donated to GeekGirlCon when you use the code 12164679. When I was a kid, there was one television channel I could to watch without parental supervision and that was the local PBS affiliate. I absorbed all the classics: Sesame Street, Electric Company, Vegetable Soup, Doctor Who, Monty Python… okay, the last two weaseled their way in there when my mother wasn’t paying close attention to my media consumption. So believe me when I tell you that it was a big deal when my mother let me watch Wonder Woman. If you are of a certain age, there is a good chance that you did what I used to do, or a reasonable facsimile thereof. You might have painstakingly fashioned a tiara and bracelets out of aluminum foil, and used a red marker to make the stars just right. You might have borrowed a bedsheet to wear as a cape and lastly, you might have found something that resembled a gold lasso to complete the ensemble. If you were me, you begged your mother to buy the fancy cord remnant that you found at the fabric store. Then every week, you donned your makeshift superhero costume and you were ready for the show to come on. Those animated stars exploded across the screen and that theme song kicked in! What comes to mind when you think about Wonder Woman: the comic, the show, the cartoon, the movie? I see all those things and more. I think about what she represents to me and in turn, to others. I recall the statuesque and jaw-droppingly beautiful Lynda Carter blocking bullets with her bracelets, leaping off buildings, or spinning that iconic twirl to transform from Diana Prince into Wonder Woman. In case you were wondering, why I described my wardrobe ritual, when Diana twirled to change, I did so right along with her without fail. I’d fling the bedsheet off, whip my hair back and forth, emerging excited for the rest of the episode to see her battling against that week’s villain. I recall the animated versions of her from the Super Friends (with all its renames and spin-offs), Justice League, and Justice League Unlimited. Side tangent for a little GeekGirlCon ‘14 trivia: in the JL/JLU universe, Wonder Woman was voiced to perfection by one of our former GeekGirlCon contributors, Susan Eisenberg! Yup, pretty cool stuff! The JL/JLU Wonder Woman held her own when fighting against Superman, had a great friendship with Hawkgirl, and was easily one of the best parts of that entire animated universe. Join us for GiveBIG 2017! We’re excited to participate for a second year in Seattle’s GiveBIG and now, more than ever, we need your help! GiveBIG, sponsored by the Seattle Foundation, is an online fundraising event designed to help Seattle area nonprofits create momentum and excitement about community philanthropy. Now in its seventh year, the program has helped participating nonprofits raise more than $75 million. 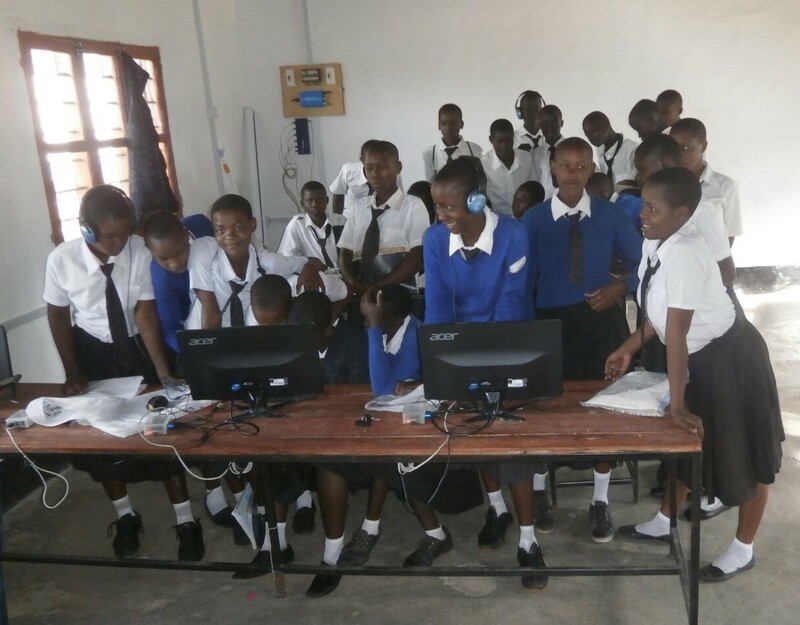 This 24-hour giving marathon takes place on May 10 from 12:00am to 11:59pm. 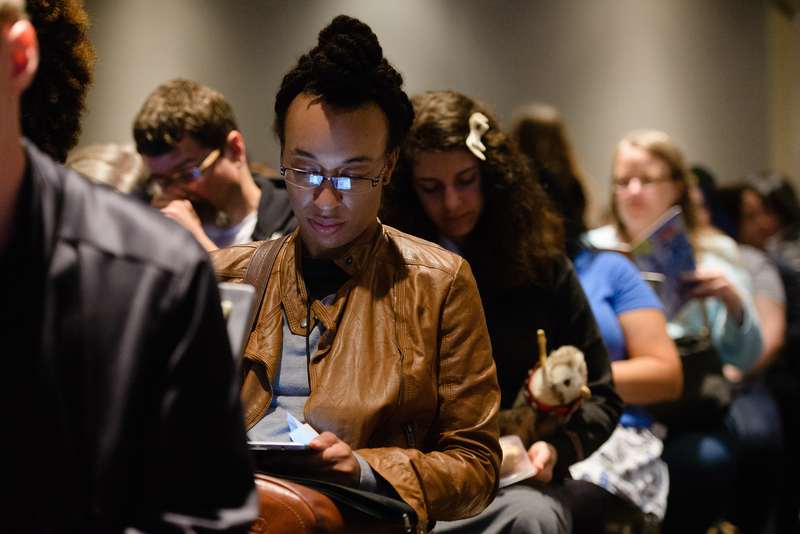 Starting now, donors can pre-schedule gifts to their favorite participating nonprofits (including GeekGirlCon). Gifts won’t be charged until the morning of May 10, but it’s a great way to get your donations scheduled in advance without having to worry about it later!